I plugged the existing one hole boxes and hung up 5 of Linda Violett's 2-hole mansions. One was apparently stolen (a first for me), so now there are four. It will be several years before any solid conclusions can be drawn about this experimental, no-trap trail. Update: 2012. I consider this experiment an uncontrolled failure. Only one bluebird ever nested in a double-holed box, and this pair fledged one young. (I think House Wrens pecked the other eggs, and they did not hatch.) 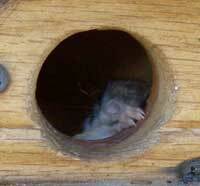 Nuthatches did successfully raise a brood in another two-holed box. The other boxes were unused, had House Sparrow attempts, were used by House Wrens which I try to discourage due to their aggressive nature towards other native birds, or were used as roost for flying squirrels. I did not follow Linda Violett's protocol however. 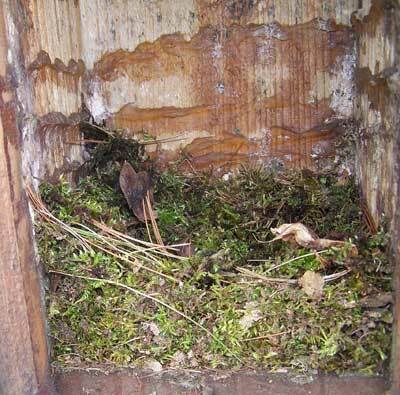 She states that there should be no single-holed nestboxes in the vicinity, and is very prescriptive about spacing. 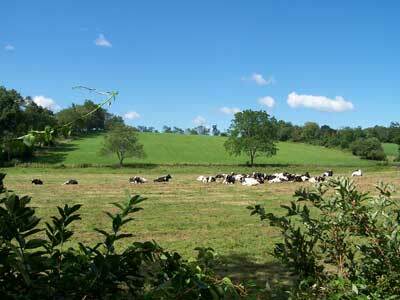 I did not have that kind of control over this area - a number of single-holed boxes I did not own were nearby. I tried removing HOSP nests from these boxes in lieu of trapping, and ended up doing nothing but removing nest after nest after nest. Eventually, House Sparrows killed a nestful of bluebird young in a box. After three years, I gave it up. 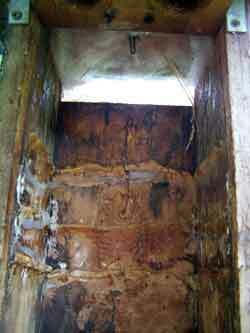 I found the two-holed boxes to be heavy, and difficult to monitor due to the need for ladders or lifting devices. I concluded they were not a good choice for my trails. However, I am assured that they are used very successfully in California, and Linda Violett indicates she has had great success with them. One of Linda Violett's 2-hole Mansions. 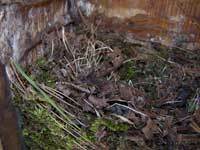 I want to see if I can duplicate Linda's success, where Western Bluebirds have been able to defend nestboxes against House Sparrows. The thought is that adults can escape a House Sparrow attack through the extra hole, and live to breed another day. See plans for Linda's boxes. Linda donated these boxes to me to test on Eastern Bluebirds, as long as I agreed not to trap on this trail. I had never used hanging boxes before. It has been a learning experience. Linda's lifter before Doug broke it (by not keeping the lifter vertical at all times). He really struggled with the proper technique and the weight of the boxes. That is partly because we had "pole" issues - Doug tried a copper pipe the first time and it was way too bendy. Then we tried a regular swimming pool pole. A heavy duty swimming pool pole (like ones Lowe's sells) is recommended. Box H-10 has a partial Plexiglas back to let more light inside, as part of an experiment to deter HOSP. Linda Violett did not find it had any effect. 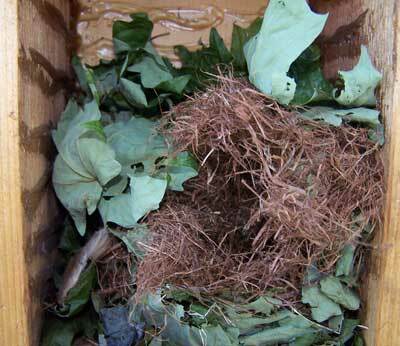 There were no HOSP attempts in this box until Titmice tried to nest in it. Note: Doug passed away suddenly in 2010. Read more about Doug and Bluebirding for Love. 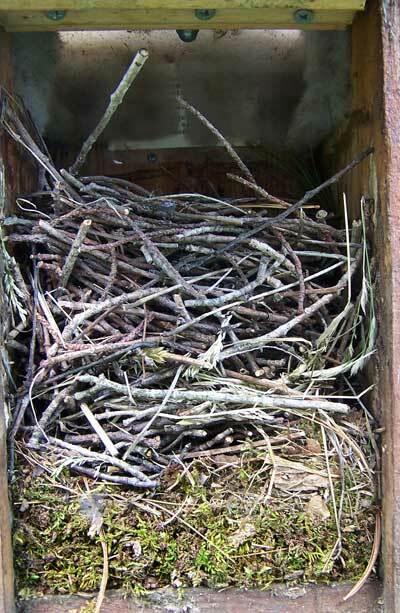 The start of a Tufted Titmouse nest in Box H-11, which is closest to the woods. 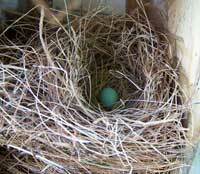 I hope the Titmouse will be able to successfully nest in this HOSP-infested area. 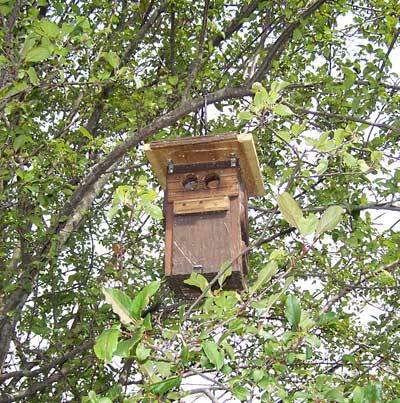 Titmice in my area seldom use nestboxes, but do seem to like to nest in boxes on trees. 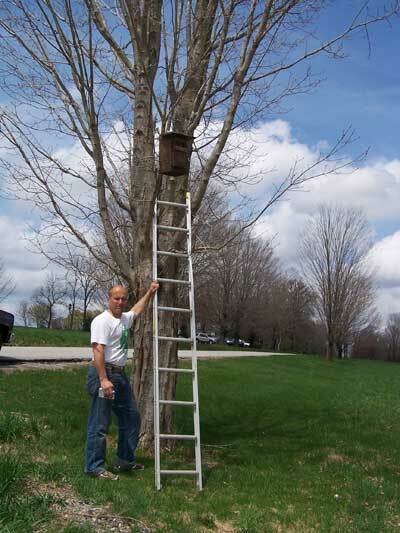 A hanging box on a smaller branch, and Linda's deep box design hopefully afford protection against climbing mammals like raccoons and red squirrels. (Fortunately we don't have problem snakes in our area). Linda indicated I should put hole reducers on this box to protect the TUTI from HOSP attack. I'm a little concerned because TUTI are easily spooked - I usually put hole reducers on after the first egg is laid to avoid abandonment. 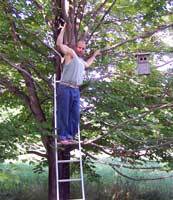 Also, I can not get confirmation from anyone that Tufted Titmice will nest in a box with a 1.25" or 1 3/8" hole reducer. All reports I have are in boxes with a 1.5" hole. 5 days later there was little change other than some additional leaves on top. 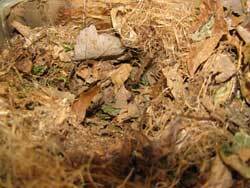 A House Sparrow nest in box H-9, which is closest to residences. 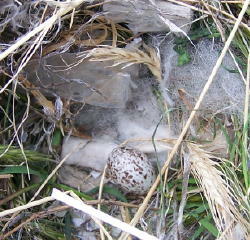 HOSP nests are being regularly removed and destroyed, but I am not trapping on this trail. Our goal is to see if a passive method (box design) is sufficient to allow Eastern Bluebirds to successfully nest in a HOSP-infested area. The reality is, many people don't want to or can't trap HOSP. Many others just want to put up a box and forget about it. 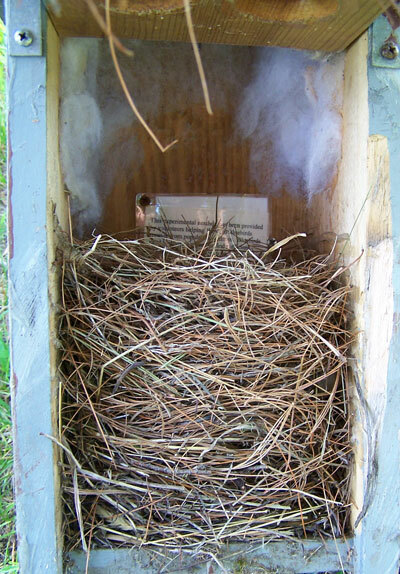 If there was a box design that enabled native birds to survive a HOSP attack, it would be very beneficial. 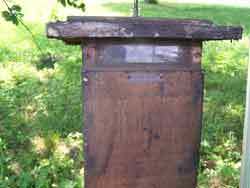 So far the only box I've used on my other trails that does not seem very appealing to House Sparrows is the Gilbertson, but even that will be used by HOSP. 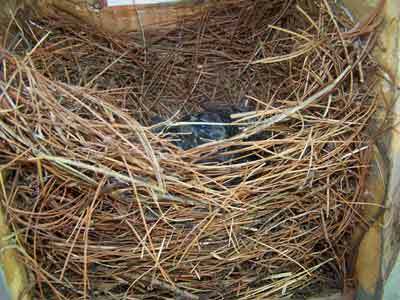 5 days later the nest had been completely rebuilt. Notice green grass, clothey/stringy stuff in center, along with two cigarette filters. On 05/06, 3 days later, they had rebuilt, same style (filters, cellophane, seed heads, plus some batting from the roof used to deter wasps) and laid one egg. I believe House Wren takeovers and attacks are more likely during the egg laying (vs. incubation) period because the nest is unattended for longer periods of time. Because House Sparrow competition forced the Titmice to move from box H-10 and rebuild a nest in H-11 (if indeed it was the same pair, as the timing seems to suggest), it delayed their egg laying and incubation sufficiently to cause their second attempt to overlap with active HOWR season. This is the way the flying squirrel activity looked at first. The adult is peeking out one of the holes in the photo on the right. 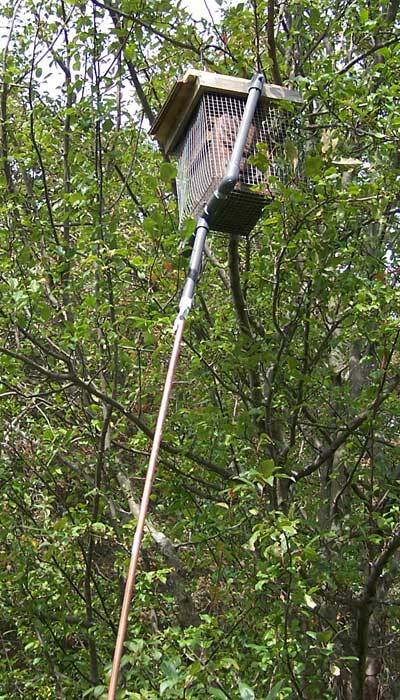 A Flying Squirrel is using box H-9. They are probably the source of the acorns I found in the box in the early spring. This may just be a roosting spot? Some grass was added later, but nothing else so far. I would love to have them breed in a box. I have never had a flying squirrel in a box before. I'm a bit surprised because this particular box, and the town green itself, are not that close to dense forest. In the photo on the left, you can barely see the squirrel's tail towards the lower right hand corner of the photo. On 6/30, the first Bluebird attempt in a 2-holer - the tallest Eastern Bluebird nest I have seen - about 7", with one blue pearl in the cup. 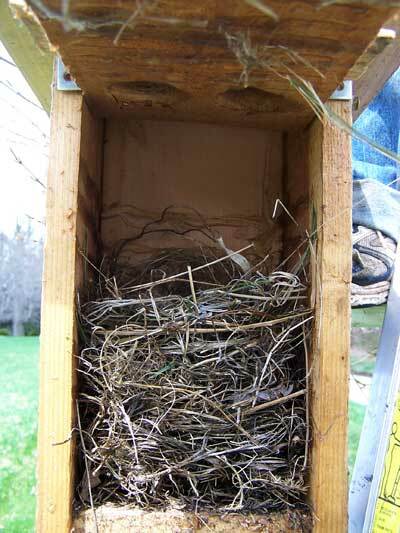 This box (H-12) had started out in 4/28 with a little grass and moss (moss possibly from the Tufted Titmice that later tried and failed to nest in two other hanging boxes), followed by several HOSP attempts with eggs. 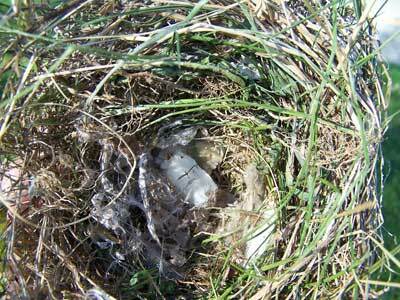 The last HOSP nest with 5 eggs was removed on 6/2 and since then it had been vacant. The timing is right for this nest to be made by the bluebird pair that just finished nesting in a field in a box that is not part of my trail, about 600 yards to the south. I almost wish I had left the HOSP nest in single holer #6 (also not part of my trail) with addled eggs so they would not disturb the bluebirds. HOSP interest in the two-holed boxes seems to have declined after weekly removal and the trees have leafed out. I don't want to get my hopes up though - HOSP are everywhere. Three eggs on July 6. The female was incubating and didn't leave the box when it was lowered - only when the door was opened. The photo shows darks spots on the two eggs on the left. The lower one is just dirt or something - the one up top MAY be a peck hole - House Wren? Linda noticed a few sticks in with the nest in the photo above. Only two babies hatched - I did not see an unhatched eggs egg in the box. 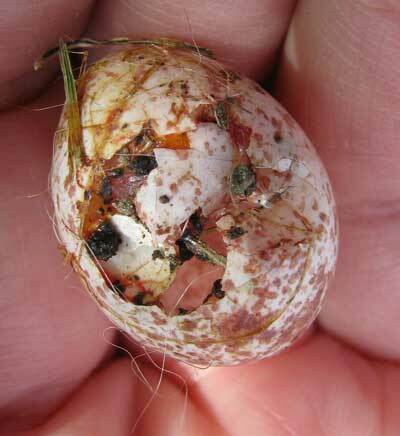 If that was a peck hole, that's probably the egg that didn't hatch and disappeared. 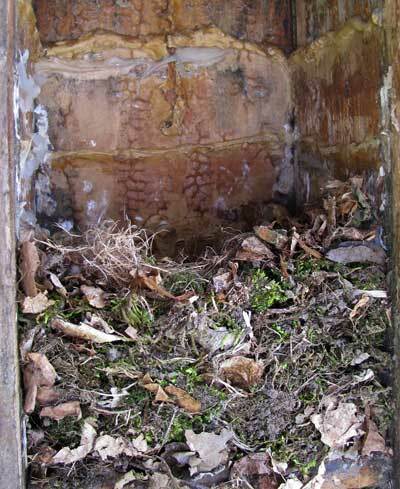 New House Sparrow nest in single-holed Box #6 (no eggs) left in place to distract them. I will probably addle the eggs if there are any next week. Lots of House Sparrows heard in the area. Turned out the HOSP abandoned the nest shortly after so I took no action. 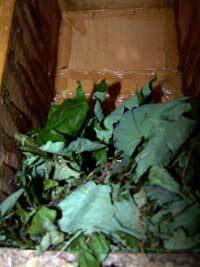 Of the other three two-holed boxes, two are empty and one has a Flying Squirrel roost. Two young nestled in the deep cup on 7/29. If the eggs hatched on 7/15 (guesstimate) they are 14 days old. 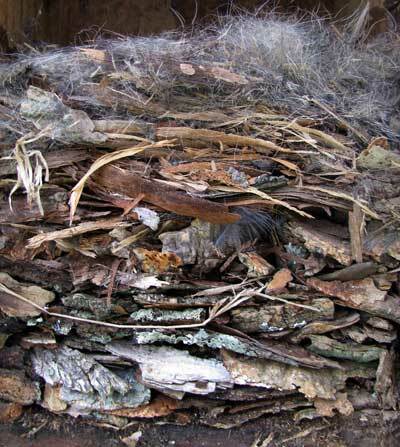 The nest is tall, but the nestcup is also VERY deep. I was THRILLED to have a bluebird pair nesting on this trail. Both bluebirds apparently fledged successfully. The box was cleaned out and left in place. Two other boxes onsite are being used by Flying Squirrels. The fourth was moved to another location about 1/2 mile away in October 2007 where there are many HOSP but no other nestboxes nearby that I know of. White-breasted Nuthatch nest on 5/3. It contains seven eggs. Photo by Bet Zimmerman. It fills up about 1/2 of the box. More on White-breasted nuthaches: Bio, photos of nests, eggs and young. 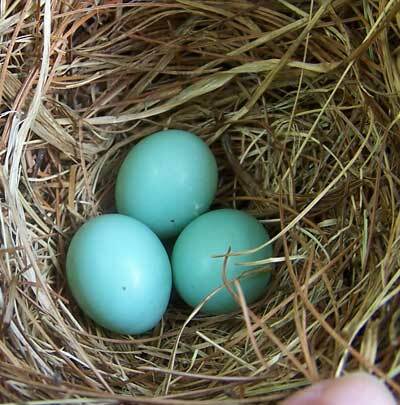 All seven Tufted Titmouse eggs found on the ground on 5/11/08. Probably House Wren or House Sparrow. This one had the broken side down facing the ground, so dirt is stuck to it. Bluebirding is a shared thread that binds people together from all over the country with different experiences, positions, problems, personalities and beliefs.